New Music Matters: Rufus Wainwright and Sharon Van Etten's Take On "Baby It's Cold Outside"
Rufus Wainwright and Sharon Van Etten's Take On "Baby It's Cold Outside"
It seems we've been listening to holiday music for at least six months now, in stores and on radio stations that have forked over their format for such things. 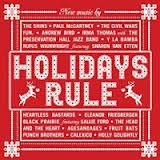 If you're looking for some new tunes to mix in I'd suggest picking up Concord Music Group's compilation, Holidays Rule. Found at Starbucks or big box stores as well as online outlets, I knew I just had to have this when I learned that The Shins take on Paul McCartney's "Wonderful Christmastime." While that song was a refreshing take after seeing Sir Paul's rehashed version on last week's Saturday Night Live, it's the next song that really sold me on the whole collection. It's "Baby, It's Cold Outside," a song of dubious intentions to be sure, but sung by a dream callobo of Rufus Wainwright and Sharon Van Etten. These are two incredibly individualistic artists that sing with heartbreaking intensity -- you can just tell that it's them from the very first note. They are also extremely talented musicians. Check out Van Etten playing guitar while fronting her band from center stage when I was covering last spring's Crossing Brooklyn Ferry at the Brooklyn Academy of Music below. I've also posted a video of Wainwright singing Leonard Cohen's anthem "Hallelujah," during a tour in 2009. (I witnessed this song the following year at the Ridgefield Playhouse, a wonderful intimate space to experience his solo piano performance.) And there's also another song by McCartney just as a bonus, the classic "The Chrismas Song (Chestnuts Roasting on an Open Fire)" follows right afterwards.